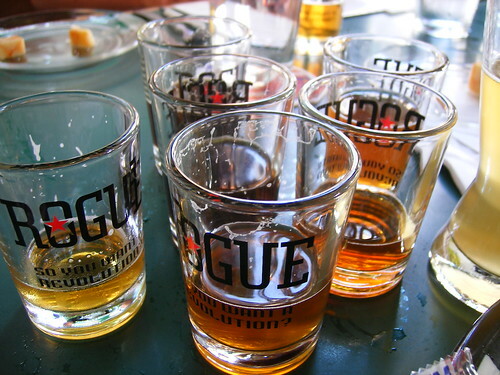 It was hosted by Rogue at their Flanders Street location but included a variety of breweries. 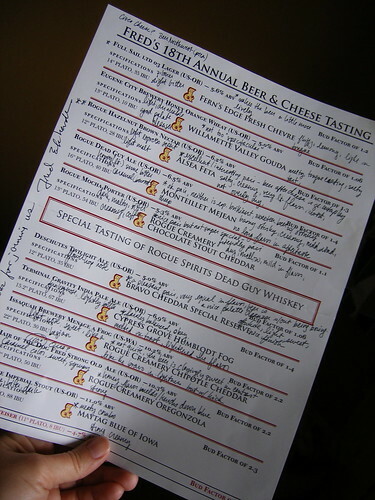 A few of the standout beers for me were Deschutes Twilight Ale, the Rogue Hazelnut Brown Nectar and Hair of the Dog Fred. The cheese was supplied by Sysco, a fine foods distributor and the portions were quite robust. Frankly, by the end of the event we were very stuffed and quite cheerful. 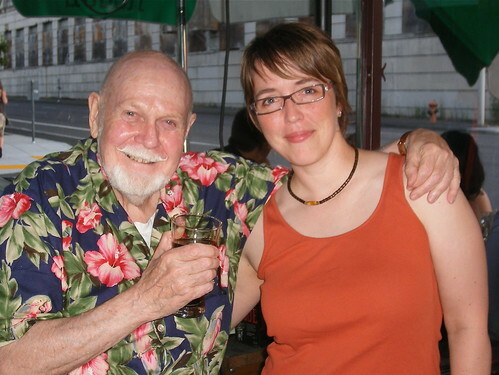 The star of the show was Fred Eckhardt, a local beer writer and celebrity who is a colorful and jolly guy, regularly surrounded by friends and fans — you’ll know him by his artfully curled mustache. Earlier this year, I attended “Fred Fest” at Hair of the Dog Brewery on the occasion of Fred’s birthday. It’s a rather intimate brew fest as far as those things go with limited ticket sales and some very special beers. I was delighted to find myself chatting with friends off in a corner when a huge platter of cheese arrived and was set on the table right in front of me! A gift from the heavens! It was really great cheese, too, not just a bunch of oily cheddar cubes. This is when I discovered that Fred is known for his interest in unique pairings, including candy and cookies and, naturally, cheese. All the food at Fred Fest was chosen by the man himself for its pairing friendliness. Last night he suggested we try warming Hair of the Dog Fred to 110 degrees and then dipping an Oreo cookie in it! Hmmm… I might try that… once. Overall the event was a lot of fun and Fred kept up a patter of beer and cheese trivia, history and advice on life while the samples came fast and furious. I would say that the pairings were good with a few standouts. The first pairing was Fern’s Edge Chevre paired with Full Sail Ltd 03 Lager. The lager was light like a pilsner and very slightly bitter, a perfect mid-day beer. The chevre was incredibly light and fluffy with notes of lemon. Sampling the beer again after the cheese made the difference. The cheese cut the bitterness of the beer, bringing out a sweet and happy flavor. 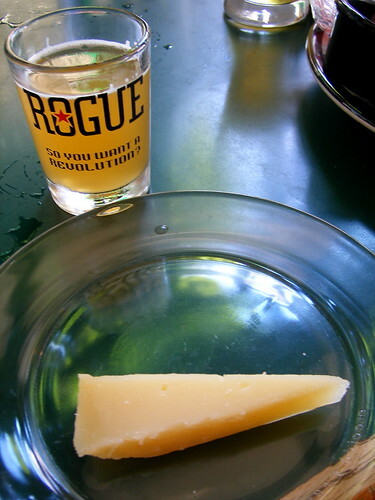 Our whole table really enjoyed the third pairing, Rogue’s Hazelnut Brown (which we used at our sampling event) with Alsea Feta. The feta was moist and creamy, not very dry, very light in flavor and salty. The interplay between those two was really just pitch perfect. I’m thinking that Browns and Porters really have a ton of potential pairings and the Rogue Brown especially has such lovely notes that I think we’ll come back to that again. Thanks Fred and Rogue and all the others who worked behind the scenes to make this happen — it was a lot of fun! You can see a few more pictures over here.